Do your students struggle to write with detail? Are their descriptions limited, lacking in specifics or uninformative? 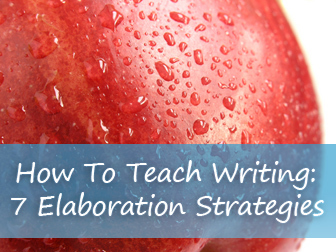 If so, you can help your students write more engaging and elaborate pieces by teaching the following strategies for elaboration. It is easy for any writer to mention a place without really telling the reader much about it. Encourage your students to go back through a piece they have written and look for a mention of a place. There may be a personal narrative or story that he was writing when he got so enthusiastic about the plot that he quickly mentioned some place that he did not describe with detail. Have your student go back and write a paragraph describing only that place. It might be where the story takes place like a forest or a school. It might be a place where the main character dreams of going, like camping or skiing. Regardless, explain to your student that adding more information about that place makes his writing more interesting and helps the reader picture himself in that place. Make sure your students know that it is okay to return to a prior piece of writing to add that kind of detail. Describing a place helps the reader put himself in the story with greater ease, and it makes the characters and event more real. • I went to the mailbox. • I ran to the mailbox. • I staggered to the mailbox. • I plodded to the mailbox. In each sentence, the speaker is going to the mailbox, but the images are quite different. With the first sentence, the reader does not get a clear picture in her mind. She does not know how the person felt or how his body was moving. Each of the other examples gives the reader a more complete picture of how the person felt and acted. Show your students these examples and ask them which one they think is boring writing. They will say that the first is boring. Then ask them how they would describe the writing in the other sentences. They will probably say it is interesting, specific or good. Ask your students if they would rather write boring or interesting pieces. They will say they would rather write interesting ones. Then encourage them that by using specific words, the writer paints a clear picture and does not have boring writing. When you are talking about using specific words, it is a good time to explain to your students how a thesaurus works. Show them that by looking up one word like happy, they can find many other ways to express that emotion to paint a clearer picture: content, joyful, blissful, cheery, fortunate, etc. The more specific the word that she uses, the clearer the picture becomes in the reader’s mind. Divide your class into pairs or small groups and have them share a piece that they have written with their partners. Then ask their groups to point out places where they do not get a clear picture from what is written. Give students time to revise their pieces and then share with their groups again. Showing not telling is the key to writing with elaboration. Place a simple common object in front of your class, like an apple, and ask them to describe it. After they have given some description, ask them to describe how the apple feels. Then ask them to describe how it smells. Ask how they think it tastes. Go through each of the five senses (sight, smell, sound, taste, touch) and ask for a specific description of the apple for each category. Show your students by focusing on one of the senses at a time, they can provide a much more detailed and therefore interesting description. Give your students a little practice in class by asking them to think of a specific object and describe that object in terms of each of the five senses. They should write their descriptions down on a piece of paper. When finished, have students exchange papers and try to guess what the other person’s object might be. Were they right? Did the writer give detailed description for each of the five senses? A simile is a phrase that compares two things using the words like or as. • He is as excited as a puppy. • The girl is like a spinning top. Both of these phrases compare a person to another object. A metaphor, on the other hand, compares two things by saying that one is the other. • They boy was an excited puppy running around the room. • The girl was a spinning top unable to stay still. Inspire your students’ creativity by challenging them to write similes and metaphors for some of their favorite characters from literature or television shows. You may also want to have them describe each other (though only do this if you are sure no one will be offended). Tell them that using similes and metaphors in their writing helps the reader associate the written piece with something that they already know. This association makes the written piece more real and engaging for that reader. If you have taught your students how to use quotations, they will be well prepared for this elaboration strategy. Using a person’s exact words is usually more interesting than a paraphrase in writing. Encourage your students to use quotations from the people they know when writing their personal narratives. If your students are writing fiction, ask them to imagine what they would say in the situation about which they are writing. Then have them use those exact words for their stories. You can find more information on teaching about quotations here on busyteacher.org in the ESL essentials section. This elaboration strategy ties into using specific vocabulary (strategy #2). With a focus on movement, encourage your students to use specific verbs rather than using adverbs. Instead of saying, “He ran to the mailbox quickly,” say, “He dashed to the mailbox.” Instead of saying, “She cried hard all night,” say “She sobbed all night.” Using specific verbs rather than a verb plus adverb combination paints a better picture for your reader and helps the author show rather than tell in his or her writing. Let your students know that this is a strategy that professional writers use to make their writing more descriptive. To practice, have your students take a piece of their writing and circle all of the adverbs. Then have them replace the verb plus adverb combination with a more specific verb. How many of the adverbs were they able to replace? Show don’t tell, the professional writer’s motto, applies to more than just good verb usage. It is the cornerstone to good writing. A strong writer will communicate his character’s feelings through her actions. Instead of writing, “She was depressed,” encourage your students to show those feelings to their readers by writing about the character’s actions. She grabbed the last tissue from the box and dabbed her eyes. She threw it on the floor with the others. She did not change out of her pajamas all day, and she sat in front of the television not even changing the channel though she had no interest in the program that was on. This activity may be challenging to your students, but the final product is worth the effort it took to create it. They say that actions speak louder than words, and when it comes to descriptive writing, it is true. These are seven proven strategies you can teach your students to produce strong, detailed writing. You can teach them to your students one at a time or take a day and go through all of them. Either way, the more your students learn about elaboration in writing, the better writers they will become.